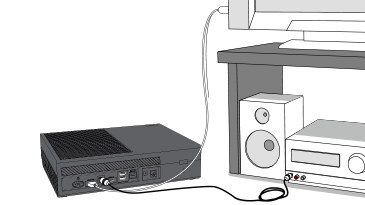 Read this page to learn how to connect your Xbox One console to a sound system. Note To connect your Xbox One to a sound system, you'll need to purchase a digital audio (TOSLink) cable. Leave the HDMI cable connected to your TV for video. Connect one end of the digital audio cable to the S/PDIF (optical audio) port on the console. Connect the other end of the digital audio cable to the digital audio input port on your receiver. Would you like to contact Support regarding the "Connect your Xbox One console to a sound system" issue you were reading about or a different issue?